Tooth Heaven is a preferred provider with major health funds. This means our patients receive the maximum benefit entitlement determined by the level of their Extras Cover – in some cases up to 90% of the cost. With our HICAPS facility, it would be very convenient for you to claim any benefits for dental without the fuss of any paperwork or ringing them up! Please note: your health fund benefit is calculated according to the level of Dental Extras Cover you have with your health insurer, and is not set by Tooth Heaven. Because we at Tooth Heaven are members for the More for Teeth program, HCF members with selected extras cover can claim 100% back on a range of diagnostic and preventative services ( includes checkups, cleans, xrays and are subject to annual limits ). HCF members are likely to also have their x-rays and mouthguards covered when you visit us. You may receive 100% benefit for a check-up, scale and clean up to twice a year, depending on the level and type of Extras cover held. The limit is up to two such services per member per calendar year. The actual benefit is determined by your level of Extras cover and is not set by Tooth Heaven. Tooth Heaven is not a member's choice provider of Medibank Private. To find out more, please visit www.medibank.com.au or make an appointment with Tooth Heaven. If you are a BUPA member on selected extras cover, you can get up to 60% back on you and your kids' general dental needs. The actual benefit is determined by your level of Extras cover and is not set by Tooth Heaven. Tooth Heaven is not part of the Member's First program. 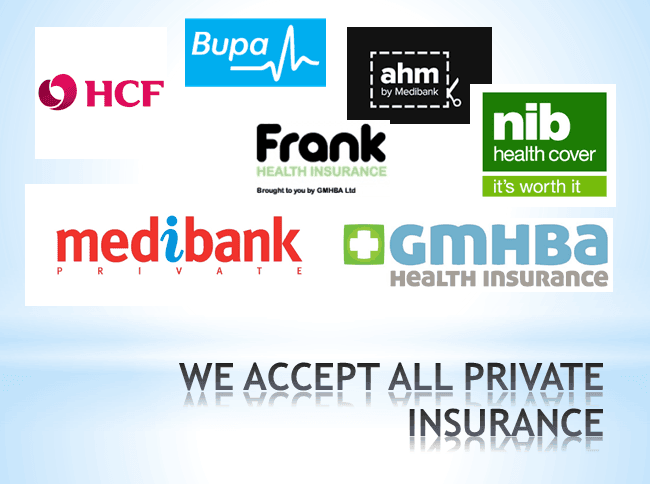 If you do not have any of the above, we still accept all other private insurance companies. Frank insurance, AHM, Transport Health, just to name a few. Who knows, you might just get something back! The actual benefit you get for dental is determined by your level of Extras cover and is not set by Tooth Heaven.